How do Chemical Storage Containers Benefit You? Hazardous materials are widely used in manufacturing operations, farming practices, water treatment facilities and are found in almost every household. Hazmat situations can be very dangerous and hazmat responders must be very cautious. 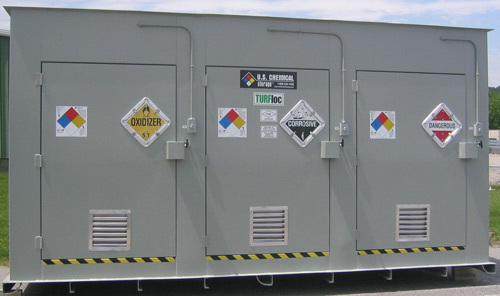 Chemical storage containers can help keep personnel, the environment and your investments safe and protected; but not all chemical storage containers are right for hazardous materials. Chemical storage containers must be made from extremely strong metal steel. They must also be welded by a professional and approved by an engineer before they go on the market. Chemical storage containers must also be suited for the job. Thorough research on the chemical that is being stored is very important before storing that chemical. Additional parts and accessories in order to maintain and manage the stored chemical are very crucial. Some chemicals may have a certain temperature that they need to be kept at, where some chemicals may need to have well circulated air flow; a climate controlled system or mechanical ventilation systems is very important for these reasons. Every U.S. Chemical Storage container is made in America and constructed from the strongest metal steel available. 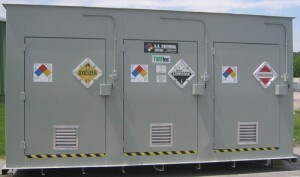 We offer our clients a 15-year structural warranty with any of our chemical storage containers. Our chemical storage containers are hand-welded, from heavy-duty metal steel to give you complete security for all of your chemical storage needs and applications. Keeping your chemical storage fully compliant and maintained is our main goal. We offer a full line of customizable accessories to provide increased safety and full compliant measures to all of your chemical storage containers. Our chemical storage containers deliver maximum strength and unmatched dependability features. The external walls of our chemical storage containers are epoxy coated for ultimate protection against extreme weathering conditions. The walls internal to the building are also epoxy coated with a chemical-resistant paint for durability and safety. Our chemical storage containers from U.S. Chemical Storage will provide you with the maximum strength and complete durability needed for compliant and secure chemical storage applications.